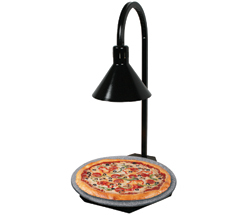 The Hatco Glo-Ray® Portable Round Heated Simulated Stone Shelf with Display Lamp has a blanket type foil element to create a uniform heat across the entire Swanstone surface, an approved foodsafe material. Four decorative base colors: Gray Granite, Bermuda Sand, Night Sky, and Sawgrass. Every Heated Stone Shelf features a thermostatically-controlled heated base to help hold your food hot and delicious.